What a great debut! Jessica Alcott takes on a taboo subject with unflinching honesty and emotion in Even When You Lie to Me. I loved this book from start to finish. I immediately liked Charlie. I felt for her, not because I was in love with a teacher, but because she is so awkward and uncomfortable around her peers. I was exactly the same way. Charlie and I even had the same type of best friend: someone beautiful, popular, and fun. Charlie lives in Lila's shadow and is happy to stay there, not because she's content but because she has such low self-esteem that she can't imagine a different high school experience. But all of that changes when she meets Mr. Drummond. Charlie immediately feels a connection to him. At first, she thinks he's making fun of her: giving her a nickname (Chuck), calling on her in class, teasing her about her answer to a question. But Lila insists that Mr. Drummond likes Charlie. And all of a sudden, Charlie's life gets a lot more interesting. This story was so enthralling. I loved the writing style, the subject matter and the character growth. 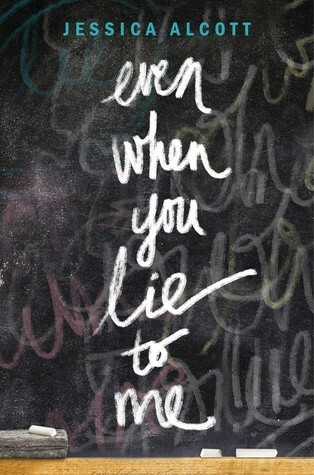 Once I started Even When You Lie to Me, I was so captivated by the story (how was it going to end?!) that I had to read it in one sitting. I loved the realism and the way Alcott developed her characters. I didn't always like them, but I always understood them and that is a hallmark of a great read. I was so conflicted as I read Even When You Lie to Me. I wanted Charlie to be happy, all the while knowing Mr. Drummond was not the right person for her. I think at its heart, this book is about first love, and how falling in love for the first time stains a person, for better or worse. I want to make it clear that I don't condone teacher-student relationships. I think that even when the student is of age, the fact that the teacher is in an authority position just makes it wrong. And Alcott seems to share the same view because her book doesn't treat the teacher-student relationship with sympathy or acceptance. No, her characters know that it's wrong, that their behavior is inappropriate, and the struggle between their desires of lust and doing what's right was the crux of the novel. Many readers will probably dislike the ending; however, I thought it was perfect, if a little abrupt. I loved the growth in Charlotte and the way she steps outside of her comfort zone and makes new friends throughout the school year. I finished the book knowing that she'd have a bright future ahead of her. Is there really anything more we can ask for in a contemporary fiction novel?